Each year as part of its annual Spectrum Awards, the American Gem Trade Association celebrates the skills and achievements of gem cutters. Distinguished judges evaluate the entries to select the best examples of the cutter’s art. Categories range from the perfect execution of timeless classic cuts, to the individual artistry of carvings, to innovative combinations of faceting and carving. The winners represent the dazzling and colorful variety of the world of gems, brought to life by the skills of masters of the craft of cutting. 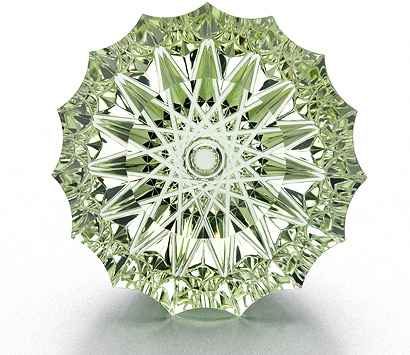 The Best of Show in this year’s competition was awarded to Dalan Hargrave and Stephanie Michael Young for this 125 carat spirographic cut mint green beryl with a concave pavilion and flat faceted crown. It’s precious sculpture in one of nature’s most valuable materials. The next eight pages feature the rest of the 2005 Spectrum Award Cutting Edge winners.